The growing popularity of collaborating with influencers is prompting more brands to partner with micro-influencers on Instagram. When you think about influencers on social media, you more often than not consider them to be ‘celebrities’ with a large follower base. 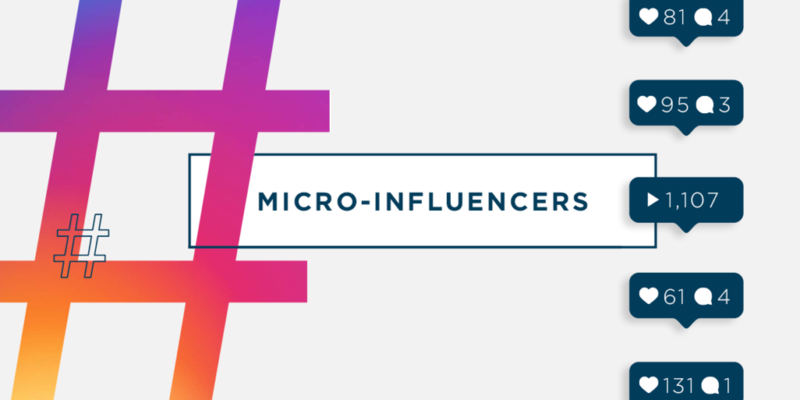 However, the sheer power of micro-influencers with much smaller follower counts who have strong levels of influence within niche audiences, are often neglected by brands. Because these micro-influencers rarely endorse and support a product or brand that they don’t personally believe in, their followers regard them as a highly credible source of information. This type of relationship is very different compared to major-influencers, because whilst they might have monumental followings, this sometimes results in their followers not genuinely believing that they are personally endorsing a product or brand. This suggests that the most effective and engaging way to create deep meaningful relationships with micro-influencers is simply let them develop an honest and trustworthy opinion that they might wish to post on their social media accounts. The benefit of approaching influencer marketing in this way, is that you will either receive positive or negative feedback from the influencer. Either way, this is still extremely valuable as it may identify how the product can be improved. What differentiates the effectiveness of micro-influencers compared to major-influencers is the engagement rates and speed. This is because it’s much easier for micro-influencers to reply to their followers. As a result, this creates meaningful connections which can make their followers feel like they have a loyal relationship with the influencer. Therefore, creating more trust when they endorse a brand or product on their Instagram account. Here are three different ways that micro-influencers can be used to promote a product or brand. The easiest types of influencers to approach are ones that are already fans of a brand or product. When they post and endorse on their Instagram, their followers will already know that they are genuinely interested in the brand or product. The most time efficient element of this, is that there isn’t much effort required to convince the influencer to become a brand advocate. If a brand or digital marketing agency want to utilise influencers in the most effective way, then a simple Instagram post isn’t going to be the best way to approach it. Their followers won’t enjoy the post and find it interesting enough to engage with it. The influencer needs to be encouraged to tell a story. Running a one-off influencer marketing campaign to sell a single product will not be enough. However, if you are seeking to continually raise brand awareness, then you are going to need micro- influencers on a long-term basis. The most important and beneficial outcome of running on-going campaigns is that the influencer’s followers will continuously see brand content. What are the challenges of micro-influencer marketing and how can brands overcome them? Identifying users that are already familiar with your brand is a key tactic to implement at the start of a campaign. This is because they are more likely to want to endorse a product they support. This will also save time trying to introduce the brand to the influencer. If a company typically serves in a particular location, the best strategy would be to target local influencers or hashtags. For example, #webdesignsouthend or #websitedesignsouthend. Using Instagram’s hashtag algorithm will vastly help identify the most relevant influencers for a specific brand or product. When using this tactic, it’s much more effective to use narrow parameters when identifying the hashtags. 4. Don’t forget! Followers isn’t everything! You might think that the number of followers that an influencer has is all that matters – it’s not. It’s vital to acknowledge that followers are an important aspect. But, its only one piece of the puzzle that will help you identify an influencer’s brand worth. Generating a couple of mentions on social media just simply isn’t enough when running a digital marketing campaign. When aiming to maximise exposure, brands need multiple micro-influencers. This is why running these types of campaigns is so time consuming. For example, working with 10 micro influencers is 10 times more time consuming than working with one major-influencer. This is another reason why most brands decide to outsource to a digital marketing agency.